It seems we are reaching a tipping point with the way personal transport is powered. Whatever their motivation, a number of governments are announcing the phasing out of the sale of new fossil-fuel powered vehicles (or ICE – internal combustion engine – vehicles). Perhaps the economics are right? Perhaps they see the policy as a vote winner… (I’m too cynical to say that it’s purely for environmental reasons). The list of countries currently stand at 17, including the United Kingdom. But will these countries be ready for 100% of new vehicle sales to be electric (EV)? What is the current infrastructure in the UK like? And what is the true environmental benefit (or cost) of switching from ICE vehicles to EVs? As mentioned in a previous blog entry, I finally had the means and opportunity to buy a (used) EV, the poster car that arguably started the movement for EVs to become mainstream motors: the Nissan LEAF (LEAF stands for “Leading, Environmentally Friendly, Affordable Family Vehicle”). 24kWh 2013 (1st Generation) Nissan LEAF, which for me has a range of about 80 miles (varies due to many factors). 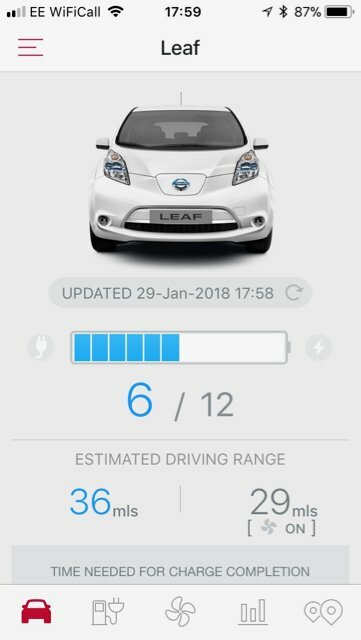 There is also a 30kWh LEAF and then latest (2018) 40kWh 2nd Generation LEAF. Two and a half months of ownership and I continue to feel smug with the choice I’ve made. There have been a number of frustrations, which I’ll highlight in this entry, but nothing unworkable. The only thing I’m unhappy with is that the car is white – so it looks pretty shoddy after only a week’s worth of commuting via Norfolk’s back-roads! I’m going to split this blog entry into parts, and each will have some student activities or enquiry attached to it – things which might be useful to embed in a lesson or two. Part 2 – Is owning an EV economical & environmental? Will they be a cause of the next “global oil crisis”? Without much shadow of a doubt, EVs are at their best over short distances and lower speeds. If you live in an urban area (or in the suburban area of the town/city where you work) then electric cars are a wonder. But despite increasing numbers of people living in urban areas (and, note, countries from which people are more likely to be able to afford an EV have a high percentage of people living in urban areas), those areas aren’t particularly EV-friendly. Take the UK, for example: 83% live in urban areas. Assuming they could all afford an EV (ridiculous assumption, yes, since urban areas tend to have the lowest incomes etc), the majority would probably not own a house with a private driveway or garage. This piece of property with the current infrastructure is for most a must, as you cannot totally rely on public chargers (more on that in a moment). However, if you have a driveway and/or garage and you do short-hops in your EV, then the supplied ‘granny charger’ is than adequate. Nicknamed a ‘granny charger’; you can charge your car via a normal domestic plug socket. But it will take hours… and hours…. EV drivers can also get a fast ‘home charger’ installed (a driveway or garage is necessary) which will charge the car a lot quicker. These aren’t cheap but do currently qualify for a grant in some countries, like the OLEV in the UK. I’ll cover more about home chargers in Part 2 – as I have had one installed myself. My Nissan LEAF is my only car at the moment – and for my personal circumstances it’s perfect. I have a 50-mile round-trip commute (so I can get to work and back on a single charge), but I also am lucky enough to have a public charging station at work. Most of my ‘anxieties’ come from when I need or want to do non-regular trips. The majority of the time I can get to-and-from on a single charge, but on the odd occasion I am reliant on what are called ‘destination chargers’, or asking a friend if I can use their driveway and plug in through their kitchen window! This is part of a phenomenon which actually has its own name: range anxiety. Currently, many EV owners would agree that the infrastructure for public charging is inadequate, and it is lagging behind both the increasing sales of EVs and the plans to phase out ICE vehicles as mentioned earlier. Fortunately there are plenty of apps which help EV drivers to find a destination charger. PlugShare and ZapMap are two of the more popular applications. You’ll find at least these two on every EV owner’s smartphone. These kinds of apps are absolutely essential when there is a need to find an available charger when out-and-about, or at a desired destination. Not only will they tell you where chargers are, but whether they are operational, faulty or occupied. You can see from the distribution of chargers, that urban areas are much better served, unsurprisingly. EV drivers who need to travel between urban areas are more likely to suffer ‘range anxiety’. But destination chargers have their problems, which seriously need addressing if they are going to be the fabric of any region’s EV charging infrastructure. One of a number of printable notes that EV drivers can put up the wind-screen wipers of ICE vehicles parked in EV bays. Although I have to say, some of the hand-written ones I’ve come across can be the most creative! A third I will highlight is the failure of charging points. Compared to a petrol pump, they seem to fail substantially more frequently. This one in Norwich trips out every time more than one EV plugs in. It has not been fixed for months, because the engineers cannot get a site permit to access it – apparently! In addition to this issue, but fortunately not as common, is the vandalism or careless use of charging points. Finally, most public chargers are ‘slow’ (3kw). Some may be rated as ‘fast’ (7kw), but that’s still a charging time of a handful of hours. ‘Rapids’; those that can do a charge in 30-45 minutes (rated up to 50kw), are fewer and further between. But ohhhh-my they are beautiful things, like this PodPoint one at a Lidl in Norwich. But, they are very ‘popular’ and you could end up queuing for use. Still, it’s a step in the right direction and the closest EV owners have to a petrol pump so far. For now… there is always the risk of this! Activity: Design a EV charging point that could work for EVs parked on the street. These could be parking bays on the side of the road, or street parking outside people’s houses where there are no driveways and garages (see pictures below). Create an annotated sketch highlighting how your charging point would work safety, and give 2 advantages and 2 disadvantages for this as a method to help develop EV charging infrastructure. Now this is where things get fun. Can you take an EV on a long journey? The more affordable EV’s don’t go very far. It’s only the most expensive ones that even get close to the equivalent of a full tank of fuel in an ICE. It was actually smooth-sailing. I didn’t mind the total extra 160 minutes journey time (there and back) stopping to charge. However, I had none of the issues mentioned above in the previous section. Any one of those could have added any amount of time for to my journey. Going on my own and giving myself plenty of time meant there was little to concern me – and mitigated against the dreaded ‘range anxiety’. Would I do it with the family? Hmm… maybe. But I think the journey would have to be part of the holiday, so-to-speak. But stops would need ‘rapids’, or some stops may require an over-nighter. The last thing you would want would be out of charge with young children. There is also the factor that road and weather conditions play a large role over long distances. Despite being mostly ‘downhill’ on the way back from Sheffield, my energy economy was lower because I was driving into a head-wind and it was wet. The winter sees your range drop even lower are batteries aren’t as efficient in the cold. Activity: Plan a long-distance trip for an EV. Choose one of the following EV’s from the ‘Plugless’ graphic above: Chevrolet Volt, Nissan LEAF 30kWh or Tesla Model 3. Use an EV route planner like ZapMap to plan a journey from your school to a place of your choice at least 200 miles away. Work out where and how many times you would need to stop. Can you work out a route that’s more appealing, where charging points are available at places of interest rather than just service stations? Discuss how your journey would be different in an EV than an ICE vehicle that could do the journey without needing to refuel. Would it be worth it? While the commentary above is from my personal experience and points of view, there are plenty of EV drivers who have both similar or differing experiences. A thank you to members of the UK Nissan LEAF Owners and Nissan LEAF Owners groups on Facebook, whose contributions and opinions provided very useful insights and information for this blog entry. Special thanks to those who permitted me to use screenshots of their posts.